This ship's bell honors the service of men and women from East Carolina College, now known as East Carolina University, who sacrificed or gave their lives defending freedom as members of the nation's armed forces. It rests atop a short brick base with a stone cap. The bell was cast from bronze in Philadelphia in 1855 and served on a number of naval ships until its final installation on the USS Broome, commissioned in 1919. The ship was sold for scrap metal after World War II and the bell salvaged. The university acquired it in 1953 to commemorate the efforts of military personnel from then East Carolina College (ECC) who served in World War II and the Korean Conflict. In 1953, the bell was placed outside Christenbury Memorial Gym on the east side of a walkway next to the gym. A lawn area with trees was located on the west side of the walkway at that time. The bell was rededicated in 2011 with the development of the Freedom Wall and Memorial Walk to honor veterans of all wars and to create a space of renewed commemorative relevance for the 21st century. A bronze plaque from the 1953 commemoration originally located on the original brick base is now located near the bell. Today the bell sits atop a short brick base and is located on the west side of the walkway, just a few steps away from the original location. The first dedication took place October 10, 1953. The bell was rededicated on April 26, 2011 as part of the newly created Freedom Wall and Memorial Walk. The bell was donated by the United States Navy. Funds for transport of the bell from Washington, D.C. and its installation at the university were raised by the East Carolina College Veterans Club. 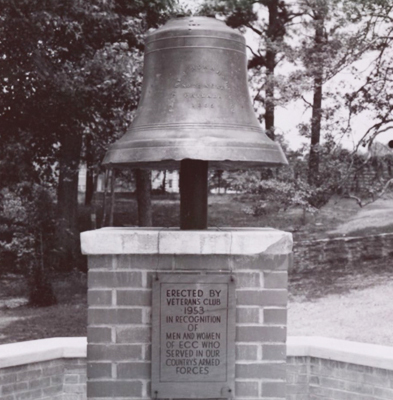 The bell was originally dedicated on October 10, 1953 during Homecoming activities. It was rededicated in its new location across the walkway from the original location on the university Founders Day on April 26, 2011, with the dedication of the Freedom Wall and Memorial Walk. Several men and women associated with ECU who have died in service were honored at the 2011 service. During the dedication, the first pavers for the new walkway were laid in honor of named individuals who served. Efforts to obtain the bell were originally begun by the Veterans Club, with their specific interest to obtain a bell used on a World War II naval ship. Following the installation, the bell became a symbol of victory for the university and was struck with each athletic victory. The rededication in 2011 was intended to enlarge the university's original commemoration to those serving in all military efforts. ECU, formerly known as Eastern Carolina College, established one of the nation's first Air Force ROTC programs in 1948, shortly after the Air Force was created in 1947. The bell sits along the west side of a walkway between the Howell Science Complex and the Christenbury Memorial Gymnasium. The bell memorial is part of an integrated memorial walkway and commemorative wall. The site includes a brick walkway with engraved commemorative pavers, a lawn area, trees, and plantings. A large commemorative plaque on the Freedom Wall sits directly behind the bell. The bell was originally located just several feet away along a walkway next to Christenbury Memorial Gymnasium. In the plans for the creation of the Freedom Wall and Memorial Walk, the bell was moved just across the walkway to a new location next to the Howell Science Complex. The bell now sits on the west side of the walkway facing east. The university observed Veterans Day 2011 at the commemorative site. The Veterans Day message was delivered by retired Col. Joe Marm of Goldsboro. A brick paver was placed in the walkway to honor several ECU graduates and former service members who were in attendance. Names of service personnel from ECU whose names will be engraved on pavers were read, and the Victory Bell was tapped by ROTC students for each name. Gen. Gary North, commander of U.S. Pacific Air Forces, attended as the guest of honor.